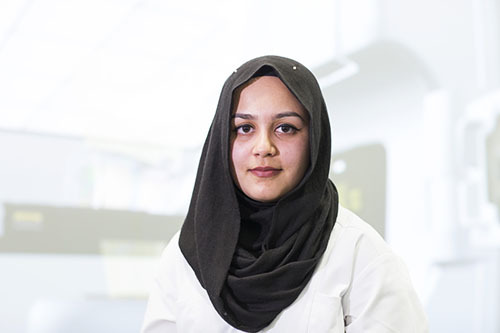 After graduation Aisha plans on working as a Therapeutic Radiographer. Initially I knew I wanted to do a healthcare course but I was quite unsure of exactly which course to pick. All I knew was that I wanted to be involved in patient care as well as being able to see and learn new things every day. When I went to a City, University of London open day I was able to talk to some of the students which helped to provide an insight into what a life of a student radiographer would be like. You can always trust students to tell you the real deal, the ups and downs of picking a course. After listening to a course overview by one of the lecturers on the open day I decided to try and spend a day at a radiotherapy department. I would highly recommend doing this as it allows you to understand what a day in a life of a Therapeutic Radiographer will entail. I decided to apply to City after going to many open days for a variety of Universities and also by researching what each university had to offer. City has a wide range of placement sites for their radiography students and they provide a balance between the time spent on clinical placement and the time spent in university lectures. The modules are broken down into manageable and logical ways, so you don’t feel like you have been thrown in the deep end when you start the course. Also the location of City is very central and easy to get to by many forms of transportation. For me the highlight of this course has to be the time that I spend on clinical placement. The most rewarding part is when you interact with patients. Clinical Placement allows you to implement the things you learnt in lectures. Everyday something new happens and you are constantly learning . Before I started this course I never would’ve thought I’d be able to be as confident as I am now. This course has really helped me to build my interpersonal skills and also helped improve my confidence. Before I went on clinical placement for the first time, I found the VERT system very helpful in understanding how the linear accelerators move and are controlled- it made it less daunting for my first day of placement because I had a rough idea of what the machine looks like and how it works. I also benefited from the eclipse planning sessions as it helped us understand how dose distribution is affected by different aspects. There were also a couple of pre-clinical tutorials given before our clinical placement which were very helpful, as we got to practice manual handling and CPR which are very important to know before you start placement. I am a Widening Participation Ambassador for City and I was involved in the Uni Mentor scheme last year. I got to help a college student with understanding the university application process. I am also a City buddy mentor and I help first year radiotherapy students in their first few weeks of university. I have been based at North Middlesex University Hospital and I really enjoy being placed there. It is a slightly smaller department than other hospitals which means that the staff are all very close and it feels like a family. I enjoy my daily interactions with patients as you start to build a rapport with them, especially when you see the same patient every day for a couple of weeks. The staff are very supporting and are always there to help and answer questions. On a typical day you would spend a lot of time interacting with patient’s- whether this is doing first day treatment chats, setting patients up for their radiotherapy treatment or just bringing them around from reception to the treatment area. Communication is a very big part of your role as a student radiographer. I am really looking forward to experiencing different and unique situations. I am also looking forward to visiting different hospitals to see how their techniques might be different. Clinical placement will really give you a feel of how life as a radiotherapy radiographer will be like. You are literally training for the job and it is vital that you absorb as much information as you can whilst you are a student. Clinical placement provides you with knowledge you will use in your interviews when applying for a job as a radiographer. Go to as many taster days and open days as possible, so you can get a feel of what the course will be about. I would also highly recommend talking to student’s on these open days as they will be able to give a student’s perspective on what the course will be like. Most importantly, try to spend a day at a radiotherapy department before your interview for the course and make sure to ask many questions- you can then use the information you gained to impress your interviewer. After I graduate I plan on working as a Therapeutic Radiographer and maybe go into further studies or even go into teaching, who knows!